Saagarika Dadu and Marie Forestier explore ways in which gender identities and norms continue to be shaped by violence in Iraq, asking questions on structural inequality and gender stereotypes. Noor, 20, has lived in Hamam al Halil 1 camp south of Mosul, with her mother, her sister and her nine-month-old baby since early 2017. She previously lived with her husband in Mosul under ISIS control, eventually fleeing the military offensive while her husband stayed behind. She has not heard from him since. He might be dead but is legally considered missing until his body is produced. Noor’s father forced her to marry this man when she was 15. She had no say in this marriage, as she would have had no say in her husband’s ideological choices. In the eyes of Iraqi authorities, Noor is considered an ISIS sympathiser because of her husband’s suspected affiliation. As a consequence, Noor faces rejection by her community as well as various restrictions and discriminative practices that often leave them open to abuses. Among them are obstacles that prevent Noor from renewing her ID documents, which would be the first step to be able to leave the camp and have some level of freedom of movement. She also cannot return to Mosul because her house was destroyed by pro-regime militias who now prevent her from returning because she is perceived to be affiliated with ISIS. Noor’s condition today is in part determined by her being a poor, displaced woman, with no means to support herself as well as an attached stigma of being perceived as ISIS-affiliated. Her individual case and many others reflect how the narrow notion of gender in Iraq has maintained patriarchal oppressive structural hierarchies and how the myriad historical socio-cultural obstacles that women face are only further exacerbated by conflict and the post-conflict punishment of insurgent-affiliated communities by heavy-handed national governments. Through interviews conducted with women perceived as being ISIS-affiliated in Iraq, we raise questions on the ways in which gender identities and norms continue to be shaped by violence in Iraq, manifest in the daily lives of poor, single and displaced women. It also explores how structural inequality and gender stereotypes are underlying realities that are only exacerbated by the impact of conflict for women. 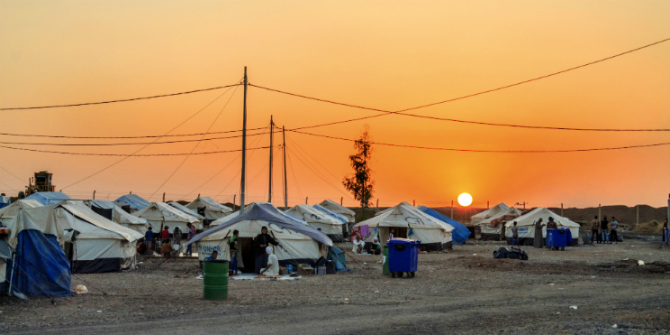 An anthropological overview of gendered vulnerability in Iraq pre and post-ISIS. ISIS in Iraq was defeated territorially in the fall of 2017. Iraqi authorities don’t distinguish between ISIS members, their wives, people who were forced to live in ISIS-controlled areas because escaping would have put their lives at risk or those who didn’t commit any crime. The Shia-majority government considers the whole Sunni community -from which ISIS members and sympathizers stem – as complicit with ISIS rise and despite its victory, remains deeply suspicious of it. Hardened by the toll of more than three years of fighting and dreading ISIS come back, Iraqi authorities have frequently – and often arbitrarily – arrested suspected ISIS potential affiliates and kept Sunni families from former ISIS-control areas in camps, where restrictions turn these camps into de facto detention camps. While ISIS members’ foreign wives have drawn a lot of attention, the fate of Iraqi women hasn’t emerged as an issue in the post ISIS conflict. Perceived ISIS-affiliated women who used to live in areas under their control have been displaced since and while some live in urban areas, the majority live in camps, alone, without a male relative often supporting children. Perception of Iraqi women ISIS-affiliation is drawn solely from their husband rather than their own individuality. They are unable to divest of an identity imposed on them by society. The necessity to be accompanied at all times by a male relative has been a socio-cultural reality for women in Iraq since before the conflict with ISIS. Then and to this day, it is male relatives – a father or a husband – that provide a woman with her identity, protection, livelihood and medium of interaction with the outside world. Even without the added layer of being perceived as ISIS-affiliated, a number of women post-conflict have found themselves in displacement with their children and having to negotiate government bureaucracy and security apparatus to claim basic rights and sustenance. To be perceived as ISIS-affiliated only excludes them further from public life, and alienates them from a political system that does not recognize them unless they are with or can prove association with a husband or a father. To address the perception of affiliation and alleviate repeated security questioning and administrative struggles, the only solution Iraqi authorities have offered to Noor and other women is the possibility to officially “dissociate” or divorce from their husbands, even if he is dead or missing. Discrimination against perceived ISIS-affiliated women is merely based on their marital status that ends up defining them entirely. The options to dissociate or divorce based on an assumed perception of ISIS affiliation, yet again takes away a woman’s choice. The compulsion to have to go through a dissociation or divorce process, in a society that is so heavily prejudiced against women bringing domestic matters in the public domain, whether or not a woman actually wants to dissociate with her husband is the place that many women are finding themselves in. Even more disturbingly, in addition to being divorced, perceived ISIS-affiliated women from Shirqat, a town west of Kirkuk, reported being asked to abandon their children in camps as the condition for the local militias to allow them to return to their hometown. But above all of this, the greatest impact of these imposed injunctions are on these very vulnerable women and their children that the Iraqi government has pledged to protect and support. In their attempts to reconstruct the country, they have, however, not only co-opted historical socio-cultural norms without fully understanding how these were exacerbated during the conflict but have invariably aggravated them through ill-conceived and myopic policies. Still, these discriminatory policies are not inevitable. While they reflect a political choice, Iraq has committed to gender-sensitive policies and even has the tools to implement them. Iraq is the first middle-eastern country to have adopted a National Action Plan, launching it in February 2014. It includes as a strategic objective to “ensure the enjoyment of equal access of women and men to resources and opportunities during the transitional period”. These provisions, adopted voluntarily by the Iraqi government, provide a solid ground to oppose discriminatory and marginalising practices. It should be used as a stepping stone to reverse the restrictive gender identity shaped by the conflict with ISIS and minimize the impact it has had on women. Saagarika Dadu (@semtokha) is a researcher working on humanitarian and development affairs. She is currently Director of Programs at Proximity International, an applied research, monitoring and evaluation organisation. Saagarika’s latest article, “Migrant rights in an age of international insecurity: Exploring the narratives of protection and security in European migration and refugee law.” was published in the Refugee Law Initiative’s Working Paper series 29 in December 2018. Marie Forestier (@MarieForestier) is a researcher and a journalist focusing on the impact of conflicts on civilians, especially women. She has worked with NGOs, academia and media in Iraq, Turkey, Afghanistan, Mali, Iran and on Syria. Marie is a former visiting fellow at the LSE Centre for Women Peace and Security, where she researched sexual violence in Syria.